In retrospect might it have been any more cost effective to start with an already built class B sprinter and then do the suspension etc.? Well, we did try to make that work. However, virtually all of the Class B Sprinter conversions were made out of the longer wheelbase (21.5 foot LOA) dual wheel 3500 model, which we felt was too big for our use. The exception is the Airstream Westfalia, which is a great camper with many fine features, but it had lots of shortcomings for our particular requirements. There was also the question of whether standard RV-type construction would hold up to our off-roadding, which we became pretty convinced it would not. Plus we had unique requirements for storing fuel, mounting recovery gear, large tank capacities, no black water tank, etc. that were incompatible with standard "street" rigs. To make a long story short, there wasn't (and still isn't) any conversion that was even moderately well-suited for our idiosyncratic use. And while it might be nice to have spent a little less money on it, I concluded there wasn't any chance of the vehicle being adequate for our needs if we started from an existing conversion. However, I'd be the first to admit that others might come to a different conclusion. Just to clarify, who actually did the hard connections fro water and the plumbing? Unless I misread your posts, CMI did the exterior and suspension as well as the interior. Why I ask is I am on the East considering just such an undertaking. The idea of one stop shopping at CMI is really appealing as long as they really can handle all aspects. You absolutely should talk to Owen Connaughton at Creative Mobile Interiors. They can, in fact, do whatever work you need, whether it's a few small modifications or the turnkey truck. In my case, CMI was building exactly what I asked them to build, based on my plans and specifications. In many cases, I even ordered and had delivered the precise equipment to be installed. But they've done lots of Sprinter conversions of all types, so they can equally well work with you to develop plans and, once you've agreed on the final outcome, they can competently handle matters without your daily input. The bottom line is that CMI is very much a group that can handle the whole nine yards. There are other groups that do Sprinter conversions, but I certainly don't know of any company, regardless of location, with the breadth of Sprinter-related talent and experience. Definitely worth the call. And be sure to let me know if you have questions or need more information. Now that my new EarthRoamer XV-JP has been safely delivered, I no longer have an excuse for avoiding work on the Sprinter build thread. With this post, I'll finish up the exterior section with the roof area. This is the full-boat roof load. Two black Pelican cases side-by-side arranged front to back, two Sceptre cans in a dedicated rack at the back passenger-side corner, and a grey Hardigg Storm case next to the cans. The cases and cans are held in a specially modified Wilderness roof rack supported by Thule supports and crossbars. In the picure below, you can maybe tell that the roof rack--and therefore the stuff on it--is offset to the passenger side. 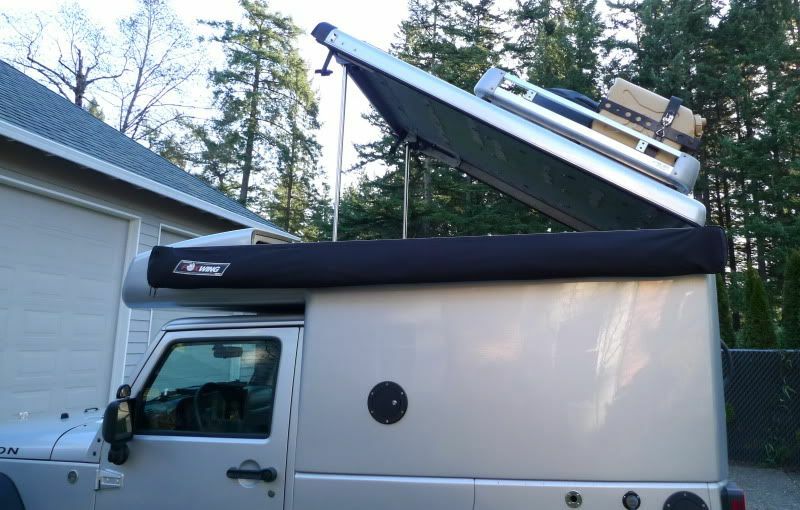 You can walk alongside the roof rack to get things out of the cases, and there's also room for a kayak (or a load of lumber) on the driver's side, though you'd have to climb on top of the cases to get things strapped down. There are actually four sets of Thule crossbars available. We did this in case we needed to carry something particularly heavy or long, like kayaks. As it turns out, two have been enough for the load (figure about 150-200 pounds per bar) and the two extra sets have mostly been in storage. The supports bolt tightly onto the Sprinter's prominent rain gutters. Interestingly, at the time we did the work, Thule didn't distribute a support tall enough for the high roof Sprinter in the U.S., so they had to be ordered from England. (Don't know if the situation is different now; I'd think it would be.) Even with their height, though, the supports and bars are very stable. The ladder comes in handy for climbing up things (duh) but the main reason for selecting this format is that it's how you get to the roof. Partly for security, partly because the rear door area was full and partly because it seems a fairly ugly appendage, I decided not to have an exterior ladder installed. When this ladder is expanded, one end fits into a special wood support block that holds the ladder as it presses against the rear doors (they have to be shut) and then the rails of the ladder rest on the front edge of the hatch. Light, compact and straightforward to deploy, but it doesn't get used all that much. Part of that is because you can easily stand on the bed and get at the can holder and the rear Storm Case, which is used more that the front cases. The big plastic hatch in the rear of the roof is probably the biggest "the jury is still out" element of my truck's design. It is made by Heki, a German company associated with Seitz, which made the truck's windows. The hatch and windows were a giant pain when the truck was being built because there wasn't good distribution to the U.S., but these days the giant RV company Dometic handles the importing and distribution, and you can find the hatch and windows in a handful of commercial U.S. RVs. The hatch allows a really nice view of the trees and stars and really helps ventilation. As mentioned, it allows access to stuff on the roof, and because of the easy access to the rear Storm Case, it has the effect of increasing storage. And in the dark, rainy Northwest winters, the amount of light that comes through the hatch is a big benefit. Also, mounting the hatch into the ridged sheet steel roof of the Sprinter was a pain, requiring cutting factory supports and putting in new bracing, and it was pretty labor intensive. There's also the problem that it took a dedicated effort to make sure it doesn't leak. There was, in spite of a ton of sealant, some inital drippage that required more sealant and rubber tape and more sealant. It doesn't leak now, but it's no longer an elegant install. My personal feeling is that as the van flexed during normal driving (not to mention off-roading), the roof metal flexed enough to open up small gaps that let water in in the rain. So, the bottom line is that I'm personally pleased I have it, but I wouldn't recommend it to the next person . . . and CMI probably would also not recommend installing one in a Sprinter roof. On the other hand, the Fantastic vent fan has been an unmitigated good idea. It was small enough to fit easily in the van roof without issues of support and flexing. It also works better than I expected, being very effective in combination with the opening rear windows; you set the fan to exhaust and it pulls a substantial amount of air through the back windows, creating a good breeze. This particular version has an automatic rain sensor that will close the vent and turn the fan off if it starts to rain. There's also a thermostat, so you can have the fan stop automatically in the middle of the night once the temperature drops, saving some power. The only bad thing was that the roof got so crowded that a "detour" had to be fabbed into the Wilderness rack to jog around the fan vent. Nothing difficult to handle, but a pain and a bit of an expense. Also on the roof, at the trailing edge are a very useful Hella 12V "work light" that really pays off backing into campsites and for setting up once you're there. It's controlled from a switch on the center console of the cab. The rear-facing camera is a really nice one--color, good in low light, and with a zoom lens with considerable adjustment--but it turns out that it wasn't as useful as expected for the simple reason that the driver can see pretty well out the back windows. It'll come into it's own when towing the Adventure Trailers' Horizon, but with nothing else back there, the view is plenty good through the windows. Of course, there's substantial weight involved when you carry the hefty roof rack, three loaded big plastic cases and two full Jerry cans, and the effect of the all that weight up high isn't good. However, I have personally been extremely pleased and surpised at how little effect the roof rack stuff seems to have. I'm thinking that the Konis and, especially, the airbags, are helping a lot with this. I know that, conceptually, the roof is a horrible place to put much weight, but it's not nearly as bad as I expected, given a vehicle that was already tall and narrow. Of course, the weight doesn't do any good, so we don't carry stuff when it's not needed. It's pretty easy to unbolt the cases from the rack (and you still have lots of room to strap down anything need to carry; it's just not weather-protected any more). The can holder comes off pretty easy, too. The roof rack also unbolts easily enough, but removing it is much better as a two-person job, or you can rig up something to hold it up to the shop roof and drive out from under it. When everything is off, the combination of less weight and better aerodynamics is worth, as best I can figure, a mile per gallon. This ends the description of the Sprinter's exterior. I'll start a new thread to do cover the interior and get started on it pretty soon. In the meantime, post up any questions that you have; I'd be happy to answer them. Mike, where'd the Jerry can holder come from? Dang that red needs a spray of rattle can.. thats genuine amazon brushed painted red there! I'll see if I can figure it where it came from from my records. Can't find it right now. It's a lot like the Hannibal and Wedco ones, but different in a couple of ways. Haven't decided whether to do anything with the INTI roof rack's finish. The black is peeling off to reveal the red, which is peeling off to reveal black again. I think I'll let it seek its own level for a while. One hell of a fine roof rack, though. Pretty sure you could land a middlin' sized helicopter on it. 10-4 on the jerry can holder. Yeah the rack was scheduled to go into blasting and furnace to get powder coated.. but with all the work to get it apart... i just never got around to doing it. Mike, where'd the Jerry can holder come from? Well, Dave, heck if I can find where my can carrier came from. I looked in my records and couldn't find the purchase, and then I looked through the web from all the suppliers I used and they don't have one quite like it. I suppose it could have come from one of the now-defunct companies like OffRoad Recovery or Browne and Ware, or maybe the design just got changed slightly in the last three+ years. So if anyone knows where this exact carrier came from--note the high rear, low sides, stamped out holes, strapping around top and upwards side of cans, and side latching--please post up. Thank you kindly. Let me know if you have any qestions. Not much new Sprinter news except that I just replaced the three Meridian house batteries--at near $2K--with new Odysseys. Not really a change, though; Enersys, if I understand this correctly, is the battery maker and Meridian and Odyssey are two of their brands. Someone decided to make these available as the Odyssey PT1800-FT, which is actually a good change because there are a lot of Odyssey dealers to get these for you, whereas the Meridian brand was hard to find. Mike, how has your sprinter been off-road? I've been "waiting" for a 4x4 sprinter for a while now and maybe it's time to get moving on a 2wd one. I'm mostly traveling around the deserts of the southwest. Not looking to go on real rock crawling trails, but do want to have access to reasonable jeep roads. Thanks! Sorry I missed the question. PM replied to, but for the rest of the audience . . . It works a bit better than you might expect, but it's not magical. It's more solid than I expected, and for forest service or BLM roads in good weather, I don't know that it gives away anything to any stock truck of similar size. Good ground clearance, easy to steer, a turning circle much less than any pickup and most SUVs, and with the high driving position, very easy to place on a trail. And the inline 5 diesel has excellent plodding-along characteristics. However, it is two wheel drive with no diff locks, so it doesn't do that well with slippery. Well, actually, because mine has significant weight over the rear wheels, it does better than other Sprinters or unloaded pickups. And there's room for chains, which will solve snow problems. But as I say, not magical. Still, ask yourself how much time you really need to be in 4WD to do your travels. If the answer is "not much," you might be very happy traveling in a Sprinter. It's excellent off-pavement in decent conditions and you can buy enough recovery equipment to make up for the shortcomings. And if you are going to be traveling with another competent vehicle to help with the recoveries, then go for it for sure. WOw. Well thought out and well executed, Mike. Fun read. Is there a link to your Earthroamer mod? Thanks, Tom, for the compliment. Much appreciated coming from you. I noticed that this thread doesn't have links to the two other build threads for the Sprinter. I put them in up at the top, but if you're at this end of the thread . . .
Not as such. It's only recently that I've become confident that the whole thing was going to work out well. Now I'm really enthusiastic. More will be forthcoming, but here's a teaser picture with the top up by the pneumatic struts . . .